The No.1-seeded Stony Brook women’s lacrosse team improved its impressive winning streak to 12 games, the longest to begin a season in program history, defeating America East rival Binghamton 18-5 on Saturday afternoon at the Bearcats Sports Complex. Stony Brook got off to a hot start, scoring six goals in just over 15 minutes of play. The Seawolves totaled 12 goals in the first half and remained dominant over the Bearcats offense, outscoring them 6-5 in the second half. Senior attacker Kylie Ohlmiller led the team with six goals and extended her season total to 51. Redshirt-senior attacker Courtney Murphy scored the first goal of the contest four minutes in, adding to her NCAA Division I record for career goals earned on Thursday night. The goal lit a fuse in the Seawolves’ offense as the team went on to score 12 unanswered goals in the first half. Ohlmiller, Murphy, and sophomore midfielder Ally Kennedy each secured a hat-trick before time expired in the first. The Seawolves offense remained dominant, outshooting the Bearcats 39-16 and outdrawing them 13-9 in the game. The team remained in sync throughout the game and capitalized on the Bearcats’ 17 turnovers throughout the game. When Binghamton senior midfielder Jacqueline Kennedy started the second half with a goal, Ohlmiller responded with two consecutive goals in three minutes to extend the Stony Brook lead to 14-1. The Bearcats attempted to mount a comeback, scoring three straight goals in the middle of the second half, but the Seawolves never allowed them to cut the lead under 10. Ohlmiller and freshman midfielder Siobhan Rafferty added three last-minute insurance goals to extend the team’s conference record to 4-0. The victory also increases the team’s overall record to 12-0, leaving the Seawolves as one of two undefeated Division I teams, along with Boston College. 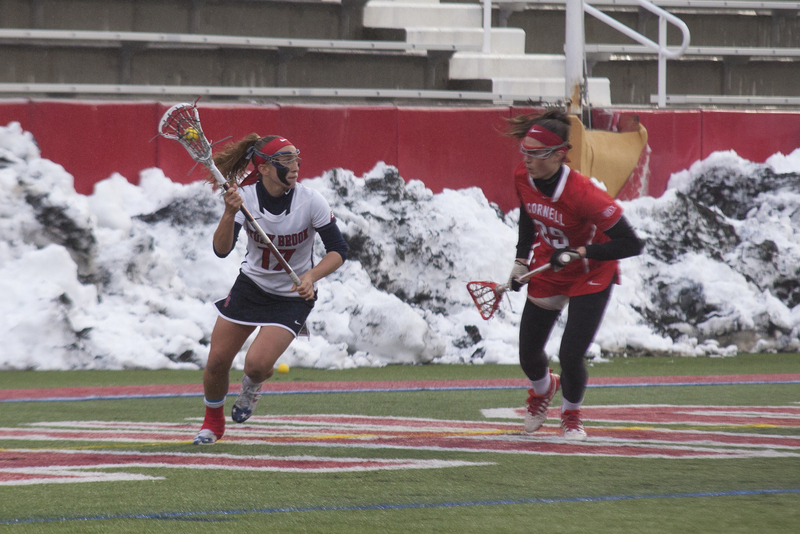 Nine different players recorded points for the Seawolves, with seven of them scoring goals. Five players scored two or more goals including Murphy, Kennedy, Ohlmiller, sophomore attacker Taryn Ohlmiller and Rafferty. All eyes are now on Kylie Ohlmiller to break two NCAA Division I records after Murphy became the new NCAA Division I career goals record holder. Kylie Ohlmiller needs 23 more points in order to break Maryland alumna Jen Adams’ record of 445 total points scored. The senior captain also needs 17 more assists to overtake the record set by Northwestern alumna Hannah Nielsen with 224. Stony Brook will return to Kenneth P. LaValle Stadium for a four-game homestand, beginning with Johns Hopkins on Friday, April 13. The first face-off is scheduled for 7 p.m.